It is not a simple question of arithmetic, however much we might wish to make it so. Nearly 30 years ago, a wealthy young man with whom I was practicing law asked me whether “tithing” should be computed on a pre-tax or after-tax basis. By the world’s standards, he was an exceptionally fine and decent human being, raised in privilege but also taught by his parents and church that privilege carries with it duty. He wanted advice on what his duty was, how much he needed to give. In comparison to most Americans, my young friend was being unusually generous. Studies have consistently shown that Americans, the vast majority of whom still regard themselves as in some sense Christians, give an average of about two percent of their income to charity. However, tithing is not the New Testament answer to how much we should give. Even in the Old Testament, the Mosaic law included multiple tithes for various purposes that would have had the combined effect of requiring far more than a simple 10 percent rule for giving (Leviticus 27:30-33; Numbers 18:20-21; Deuteronomy 12:17-18; 14:28-29). It also included other teachings about generosity, such as the command to property owners to be intentionally inefficient at harvest to let the poor glean after them in their fields (Leviticus 19:9-10; 23:22). This was beautifully exemplified by Boaz in his treatment of Ruth. More fundamentally, God has always called on His people to show generosity beyond compliance with any mechanical rule. Just as James teaches in the New Testament that “religion that is pure and undefiled” is defined, in part, by charity (James 1:27 esv), so Isaiah in the Old Testament defines the true religious observance chosen by God: “Is it not to share your bread with the hungry and bring the homeless poor into your house; when you see the naked, to cover him, and not to hide yourself from your own flesh?” (Isaiah 58:7). Thus God has not established for His servants a specific minimum standard of generosity. Instead, as illustrated in the parables of the talents (Matthew 25:14-30) and the minas (Luke 19:11-27), God has chosen to entrust us with the power to use His gifts in His service but left to us the responsibility of judging how we may best fulfill that trust. To answer as wisely as possible whether we are giving enough, I would suggest asking ourselves three related questions that naturally involve a train of thoughtful consideration relevant to the overall question. Are We Giving in Reasonable Proportion? First, are we giving in reasonable proportion to our prosperity? Paul instructed that each of the Corinthians should, each first day of the week, “put something aside and store it up, as he may prosper” (1 Corinthians 16:7). In doing so, Paul is merely applying the common sense rule of a just God that “to whom much was given, of him much will be required” (Luke 12:48). Many Americans have been so rich for so long they have forgotten they are rich. Especially since the financial crisis of 2008-2009, our media reflect a pervasive sense of grievance that we are not getting richer. A dose of reality might do us good. Just to cite one example, both the Asian Development Bank and the African Development Bank have celebrated the recent increase in the middle class on those continents, but they define “middle class” as including those who make at least $2 per day. In Africa alone, more than half a billion people must survive on less. We tend to regard a spacious and secure dwelling; warmth in winter and cooling in summer; a car; food that is sufficient, varied and pleasurable; clothing that allows us to fit in socially in a rich society; access to modern technology; and many other conveniences as though they were literally necessities required for us to live. Most of our fellow human beings, now as in the past, live without them. This is not meant to make us feel guilty about God’s blessings. As Solomon said long ago, “wealth and possessions and power to enjoy them … this is the gift of God” (Ecclesiastes 5:19). Material prosperity should not make us feel guilty, but it should make us feel grateful to God and generous to others. For those of us who have been given unusual prosperity, even by American standards, our gratitude should include not only that God has given us comfort and freedom from any rational anxiety concerning material needs but that he has entrusted us with such a powerful means of doing good, allowing us to be the instruments of His grace and partners in the gospel. When we consider how richly we have been blessed in light of the needs of others, are we giving enough? Are We Putting Our Wealth to Use? Second, are we putting our wealth to its wisest and best use? Worldly wisdom teaches the folly of wasting wealth. Consumers naturally seek the greatest value for the money they spend. Investors naturally seek the safest and highest return on the money they invest. Christians differ from the world in their judgment as to what is valuable, but they still would rationally wish to maximize the value achieved by every aspect of their lives, including wealth. As the parables of stewardship imply, this natural and sensible desire to put valuable resources to valuable use is made more urgent when we realize that all such resources belong to God and are intended to be valuable in His service. The Bible warns us against using wealth in ways that simply do not make sense. Isaiah asks, “Why do you spend your money for that which is not bread, and your labor for that which does not satisfy?” (Isaiah 55:2). When Jesus warned us not to lay up treasures on earth, his reasoning included the inferior security of any such treasure (Matthew 6:19-21). Paul warned that the greedy have “pierced themselves with many pangs” (1 Timothy 6:10). In the words of William Law, the foolish use of wealth is like refusing to buy medicine for the poor so that we can buy poison for ourselves. On the other hand, if we trust our Savior’s promise that “it is more blessed to give than to receive” (Acts 20:35), it is apparent that generous giving can bring great value to the giver. Indeed, a central paradox of the Christian life is the pleasure for self that unselfishness brings: the more we focus on others, the more we find ourselves. Many older Christians and even many worldly people, looking back on their lives, would agree that the greatest happiness wealth ever brought them was a joyful satisfaction in helping others. Perhaps this psychological truth derives, in part, from a physical truth. Money has greater value meeting needs than in supplying luxuries and finds its greatest value in meeting the most important needs of those who would otherwise be destroyed by ignorance and want. Money that would make no discernible difference in our lives if spent on some incremental luxury can make the difference between life and death, spiritually and physically, for those with no resources of their own. Even beyond the joy that giving directly brings to the giver, Jesus teaches a more profound effect on lasting happiness. “Where your treasure is, there your heart will be also” (Matthew 6:21) is often taken as a warning, but it is also a promise. When we invest ourselves in the gospel and in other people, we change our own hearts, directing our affections in a way that leads home to the source of every good and perfect gift. When we consider how much good for others and happiness for ourselves can be made possible by our giving, are we giving enough? Finally, what does our giving say about how much we love God? Paul encouraged the Corinthians to give for the relief of the churches in Palestine by telling them of the generosity of other churches, and explains that he does so “to prove by the earnestness of others that your love also is genuine” (2 Corinthians 8:8). Every command of God tests whether we love Him, for if we love Him, we will keep His commandments (John 14:15); but surely love does more than just obey. Paul described how the churches of Macedonia had surprised him by the wealth and character of their generosity: “For they gave according to their means, as I can testify, and beyond their means, of their own accord, begging us earnestly for the favor of taking part in the relief of the saints” (2 Corinthians 8:3-4). He exhorted the Corinthians to follow this example and “excel in this act of grace also” (v. 7). At the end of the chapter, he exhorted again, “So give proof before the churches of your love” (v. 24). Virtually all Christians say to themselves and not just to others that they love God, and they do so without conscious dishonesty. We understand that Christianity without love for God would be a meaningless contradiction. Every time we decide how much to give to the church and other charities, we affirm our decision to love God and reflect the character of the love we feel. 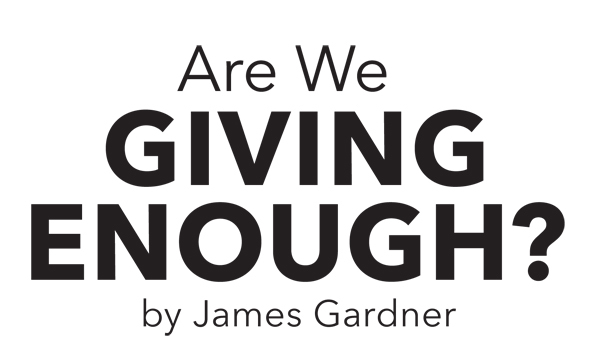 Considering what every gift we give says about how much we love God, are we giving enough? James Gardner is a member of the Henderson Church of Christ. He can be contacted at jgardner@fhu.edu.